Today is the start of the 23nd Annual WoodenBoat Show at Mystic Seaport in Mystic, Connecticut, which, as usual, is a three-day event. More than 100 traditional classics and contemporary wooden boats of every type will be on display at this festival that celebrates the design and craftsmanship of wooden craft. This year’s event will honour three of N.G. Herreshoff’s most beloved designs: the 12 ½, Newport 29, and Buzzards Bay 25. All three were originally conceived in 1914 and turn 100 this year. 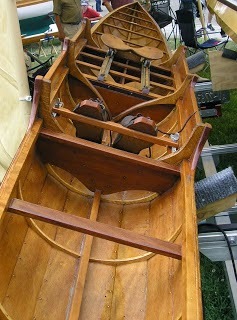 The WoodenBoat Show offers something for all wooden boat enthusiasts and marine history buffs. Wooden boats of every type – large and small, old and new, power, sail, oar and paddle – will be on display including cruising yachts, launches, runabouts, fishing boats, performance powerboats, daysailers, dinghies, rowboats, canoes, performance shells, multi-hulls and racing boats.